With a little drifting, a pig, and a work of art? JDM enthusiasts are very familiar with the legendary Nissan Skyline. The Skyline used to be the car that the GT-R was based on before Nissan split the two names apart with the R35. Now that the GT-R is no longer a Skyline, some people figured that Nissan just stopped building it all together. Believe it or not, Nissan still builds the Skyline as a JDM-only model. The Skyline is actually the same car that we know in the US as the Infiniti Q50. It even uses the Infiniti badge, which somehow means Skyline in Japan. Like its Infiniti counterpart, the Nissan Skyline is offered with a range-topping 3.0-liter twin turbo V6 with 400 hp. For 2018, Nissan also added a 2.0-liter four-cylinder turbo, a detuned V6 with 300 hp, and a 3.5-liter V6 hybrid. But the way that Nissan markets the Skyline in Japan is a bit odd. A group of Nissan engineers set out to recreate a work of art by drifting the lines into an empty parking lot. The work of art was painted by a pig named Pigcassso. The whole thing is a bit silly, but it does show off the Skyline's ability to drift. German race car driver Michael Krumm drifts the car through the lines and proves that the Skyline is capable of some sideways fun. 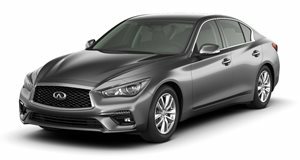 It is a bit odd that Nissan still sells the Skyline as the Q50, but we think that this adds a little bit of pedigree to the Infiniti. We've driven the 300 hp version of the car, and came away a underwhelmed. The 400 hp is certainly better, but Infiniti needs to come up with a competitor for AMG and M cars to recapture the Skyline GT-R's greatness. It’s way better than the G37 it replaces, but is the Infiniti Q50 a worthy 3 Series rival? "Being average" sold a lot of Q50s for Infiniti last year. Infiniti is offering something interesting for its top-spec Q50 model.